The Branch invites new members who come to their first meeting to have their photo taken and give a few words about themselves: see them at www.londonfreelance.org/lfb/intros.html. 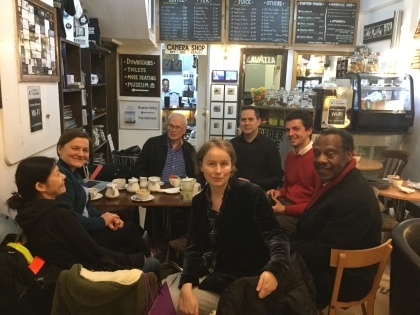 Shown here is a recent LFB New Members' Meeting in January. These meetings happen at the Camera Café on the last Thursday of every third month. They offer an opportunity to meet other members new to freelancing and ask questions of more experienced members. The next is at the the Camera Café, Museum Street, London WC1A 1LY on Thursday 27 April 2017 from 6pm.